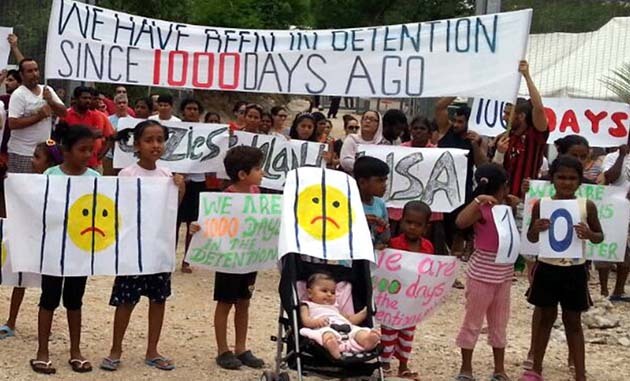 Every afternoon since 20 March, asylum seekers at the family camp on Nauru, women, men, teenagers, and children, have staged a protest at the main gate to the camp. The protesters are calling for their claims to be processed; for an end to the discrimination against them; for Nauru to be closed and for them to be brought to Australia. Broadspectrum and Wilson Security have tried to stifle the protests—fences have been erected to prevent the protesters from reaching the gate of the supposedly “open centre”; Nauruan police have blockaded roads to prevent refugees living outside the centre showing support for the protesters; and police have confiscated refugees’ phones to prevent photos and video clips of the protests from reaching the outside world. But each day brings another protest. On 3 April seven teenagers staged a tent-top protest—everyone lives in tents in the family camp—resulting in a letter from the protesters being sent to Border Force in Canberra. The letter outlined the many ways those on Nauru have been discriminated against—being arbitrarily selected to be transferred to Nauru while others on the same boat or arriving even later will be processed and resettled in Australia; detained for almost three years without a refugee determination; and the fact that 267 people from Nauru and Manus remain in Australia contradicting government policy. But the Border Force reply given three days later simply dismissed the concerns, repeating previous declarations that nobody sent to Nauru would be resettled in Australia and suggesting that refugees return to their home countries or consider going to Cambodia. In the protest that followed, Wilson Security guards lashed out with fists and boots at teenagers and their families, leaving a number with minor injuries. Dutton denied that children were involved despite the photographs of the protest and of the injuries inflicted on teenagers by the guards. The abuse, the contempt, the blatant lies and injustice fuels the protests. For many of the asylum seekers Good Friday, 25 March, marked 1000 days on Nauru. On 5 October last year, the Turnbull government welcomed the announcement from the Nauru government that all asylum seekers waiting for a decision would be processed “in a week.” It was a joke. Six months have passed and people are still waiting. And Turnbull has said nothing. But the facts speak for themselves. It is now over two months since the High Court ruled that detention on Nauru was legal, and the government declared that the 267 who were in Australia would be returned to Nauru or Manus Island. While Immigration Minister Peter Dutton continues to say that the 267 will be moved offshore, since the High Court decision no one has been returned. In fact almost 200 of the 257 are in community detention, including all the families with children. Dutton now says it was always the government’s intention to get children out of detention—that’s another lie. It was the public outrage of the Let Them Stay campaign and the refusal by the Lady Cilento hospital to release baby Asha to Nauru that has stopped the Turnbull government, so far. But that success won’t be secure until the 267 are allowed to stay and resettle in Australia. And until the women, men and children on Nauru and Manus Island are brought here too. It will be by building on the defiance and the protests in Australia and Nauru that we can turn “Let Them Stay” into “Bring Them Here”. An ABC investigation has revealed how millions of detention dollars are being channeled into the hands of government politicians and elite Nauruan landowners. While the previous Nauruan government bought land for the family camp, that site was never used. Instead the camp sits on land owned by the Daimon clan which includes Nauru’s Minister of Justice and Border Protection, David Adeang. Consequently, the rent for the site, at least $480,000 a year goes to the Daimon clan, not the Nauruan government. The mother of Nauru’s Environment Minister, Aaron Cook, earns rent worth $30,000 a year, making her the second largest beneficiary of all 256 landowners listed. David Adeang’s cousin is also the Nauruan appointed operations manager at the camp. On top of this the land owners will be the direct beneficiaries of the more than $20 million detention infrastructure in the family camp. The buildings will become the landowners’ property when the camp closes.